My hero is President Abraham Lincoln because he was a very honest and good man and never quit on his dreams or goals. Mr. Lincoln was born in Hardin County, Kentucky on February 12, 1809 to his parents Nancy and Thomas Lincoln. His nickname was “Honest Abe.” He had an older sister named Sarah and a younger brother named Thomas who died as a young child. In 1816, at the age of seven, he moved to southern Indiana where Lincoln’s mother died in 1818 from milk sickness. He was married to a woman named Mary Todd, and had four boys named Robert, Edward, William, and Thomas, of which only one lived to maturity. Lincoln ran for the Illinois legislature in 1832 and lost. He ran again in 1834, 1836, 1838, and 1840 and won every election. Lincoln was elected as the 16th president of the United States of America on November 6, 1860. "During his presidency, he built the Republican Party into a strong national organization, further rallied most of the northern Democrats to the Union cause, and on January 1, 1863, he issued the Emancipation Proclamation that declared forever free those slaves within the Confederacy." He also was the president during the Civil War. During his inaugural address, he warned the South by saying, "In your hands, my dissatisfied fellow countrymen, and not in mine, is the momentous issue of civil war. The government will not assail you.... You have no oath registered in Heaven to destroy the government, while I shall have the most solemn one to preserve, protect and defend it." He won re-election in 1864. 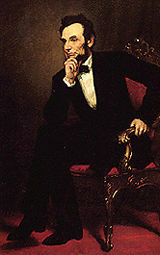 President Lincoln fought for peace until the day he was assassinated on Good Friday, April 14, 1865 at Ford's Theatre in Washington by John Wilkes Booth, an actor, "who somehow thought he was helping the South. The opposite was the result, for with Lincoln's death, the possibility of peace with magnanimity died." Abraham Lincoln was a man who showed real readership and love during his life. He was never a quitter, nor was he selfish. He showed acts of kindness, bravery, and compassion to his people and set a good example for people to follow in the future. Everyone who knew him knew he was born to be a hero, and he proved them right. He never stopped trying to reach his goals and never missed an opportunity to do his best to help make the world a better place. He wanted everyone to treat everyone (including slaves) with the same respect and wanted to make good decisions that would affect the world in the right way. I think if there were more people as good and honest as “Honest Abe” in this world, it would be a better place to live.